As the leading retailer for all things technology, it may come as a bit of a surprise that Best Buy has launched a new online shopping hub called VIVA. So now, in addition to their expansive array of technology offerings, Canadians can access everyday products ranging from health and wellness products and natural beauty products to items for baby and the latest fashion accessories, all in one easy place – bestbuy.ca. Because who doesn't love shopping online for a Maserati watch for your significant other during the wee hours of the morning, right? 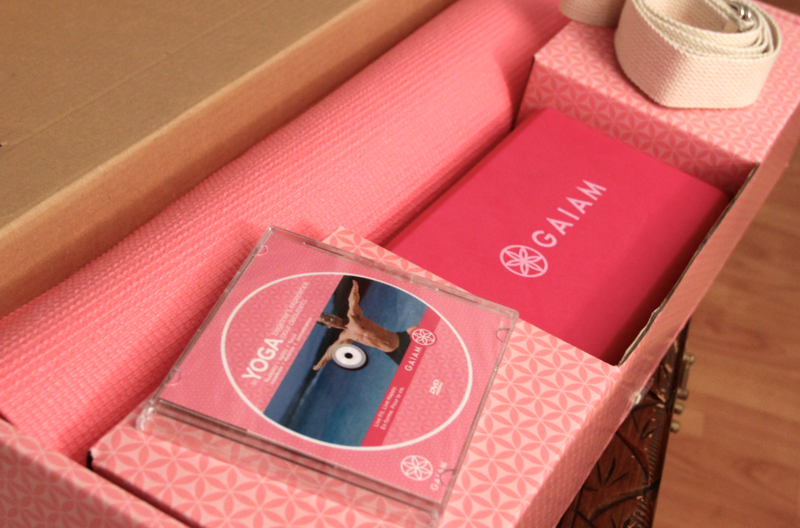 And afterwards, you can stretch out those hard-working fingers with a post-shopping yoga session using your newest Gaiam gear from VIVA, of course. The yoga mat is 3mm which is fine for me because I find when the mat is too thick, it is more difficult to maintain balance during standing poses. The strap is handy for wrapping around your feet if you have a hard time reaching them while in a standing or seated forward bend, for holding your arms in position during bridge or plow pose, or during shoulder stretches. 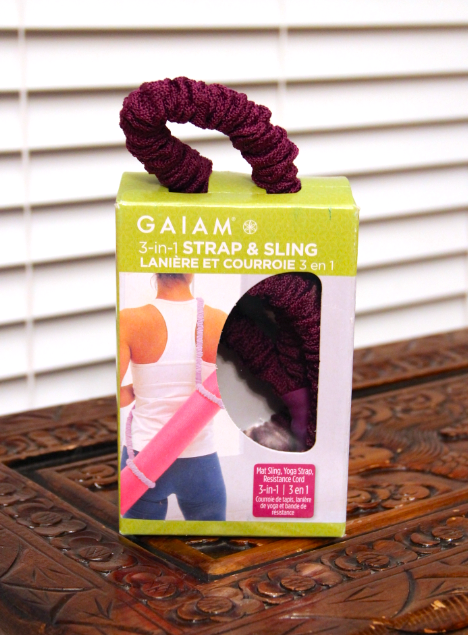 The Gaiam 3-in-1 Strap & Sling can also be used as a strap but because it is elasticized, I'd recommend using it more as a resistance band. It is also ideal for slinging your yoga mat, making it easier to carry. 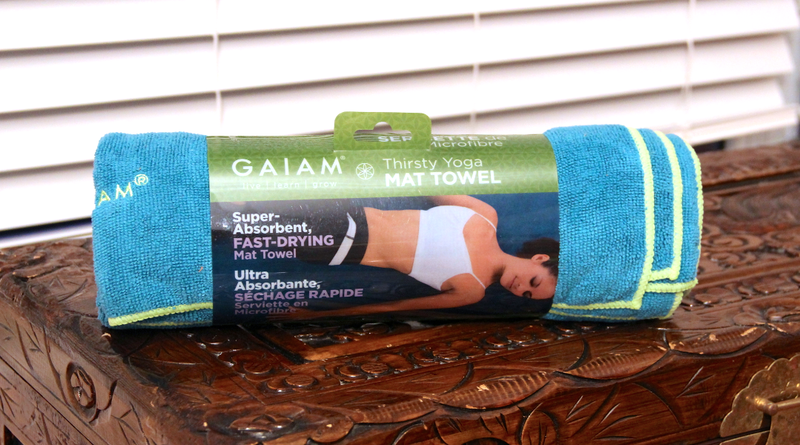 For those who tend to perspire during yoga, the Gaiam Thirsty Yoga Mat Towel is an extra-absorbent, fast-drying solution. Made from super-absorbent microfibre, it is designed to fit on top of a standard yoga mat and is ideal for Ashtanga, vinyasa, and hot yoga. If flexibility isn't quite your forté, consider using a yoga brick. It can be used to provide stability during beginner poses such as the triangle or to help more advanced yogis extend the stretch of some poses. By worrying less about maintaining your stability, the brick allows you to hold poses longer thereby increasing your flexibility. 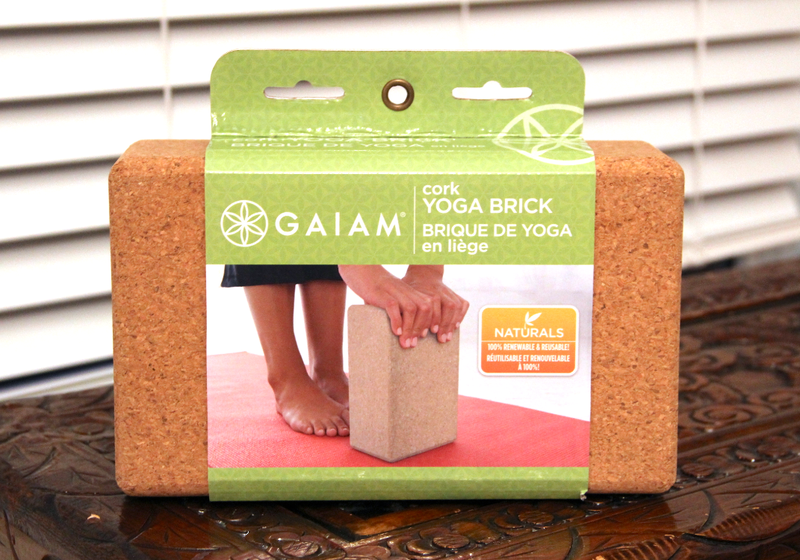 Gaiam's Cork Yoga Brick is a heavier version of the one included in the beginners' kit above but it is made from all-natural materials and is 100% renewable and reusable. 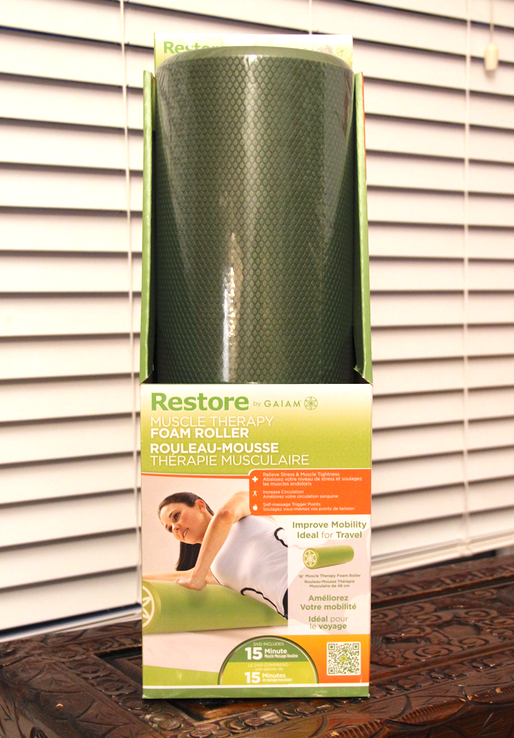 Finally, VIVA carries a selection of rollers such as this Restore by Gaiam Muscle Therapy Foam Roller. It can help relieve stress and muscle tightness, increase circulation and help massage trigger points. Did I forget to mention you can shop using PayPal? And if you sign up to VIVA, you can earn a $15 credit towards your next VIVA purchase over $50! 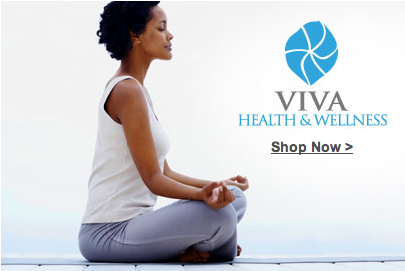 To enter, visit the VIVA Health & Wellness site and tell me which product(s) caught your eye. Leave a comment on this post and then complete the form below to be eligible to win. Open to Canadian residents only. Disclosure: I received product from VIVA from Best Buy to help facilitate this review. Any opinions expressed in this post are my own. The GoFit 7 lbs Countour Kettlebell - a little strength training always helps. ObusForme Sit-Back Cushion (CU-SBC-BK) - Black looks like something I could use! I really want the Fitbit Force Wireless Activity & Sleep Tracker (FB402SL-CAN) - Large - Slate! I really like the PürAthletics Resistance Cord Kit Deluxe from their site. The fit bit force caught my eye. Though I also need a foam roller.. I love the Kettlebell. I need some strength training. I want the Fitbit Aria Wi-Fi Smart Scale! The Fitbit Aria Wi-Fi Smart Scale would be amazing to have! The ObusForme Roll Cushion (SR-MSG-BK) - Black caught my eye. I want a Fitbit Force Wireless Activity & Sleep Tracker! The Fitbit Force Wireless Activity & Sleep Tracker really caught my eye. Such a spectacular product with many features in one! The massage chair and the kettle ball. I like the selection of vitamins and supplements and the PürAthletics Muscle Release Kit. the pilates massage and recovery kit looks great! I have my eye on the Fitbit Force. I'd also like the STOTT PILATES 28" Stability Ball Power Pack, since I've started back in Pilates classes. I would love to have the Homedics 5 Motor Massager with Heat ! The GoFit Ab Wheel look fun. I have the fitbit force and I love it now I would like the wi fi scale. I like the Fitbit Force Wireless Activity & Sleep Tracker!!!!!! The Fitbit Force looks great! If always pictured yoga to be so calming!!!! I'm really interested in the stork craft glider and ottoman sets. Homedics Bubble Bliss Foot Spa looks great! The ObusForme sti back cushion looks like something I need. I'd love the Nike Sport Watch with TomTom GPS - White. The yoga bricks, I have been eyeing them up for a while now actually. I need to pick a couple up. I would like the Everlast 2 lb Comfort Fit Ankle/ Wrist Weights...perfect for my walks! The Fitbit Aria Wi-Fi Smart Scale caught my eye. I like the Everlast 75cm Anti-Burst Fitness Ball - Blue. I like the Stamina ATS Air Rower. The Strengthening Bands & Cords caught my eye. I's love the PurAthletics Pro-Series 3.2 kg Weighted Ball (WTE1018475)! The PürAthletics Dome Exerciser is something I could really use! The Activity Tracker caught my eye. This caught my eye: Fitbit Zip Wireless Activity Tracker (FB301G) - Lime. I like the Fitbit Force Wireless Activity & Sleep Tracker. I'm totally crushing on the Stott Pilates Massage & Recovery Kit ! I carry a lot of tension in my back and this looks like a great solution! I've been hearing great things about the Fitbit Force Wireless Activity & Sleep Tracker!! It looks really nice and sleek as well. The UP by Jawbone Large Onyx caught my eye and would love to have this. Really want one of those GoFit foam rollers. It's pretty cool that the BIOS Diagnostics Weight and Body Fat Scale with Wireless Monitor will tell me how many calories I should burn. It will keep me in check. I really like the Fitbit flex wireless activity and sleep band. This really caught my eye, would love to have it! Misfit Shine Activity Monitor With Wristband. I have to say everything to do with Yoga caught my eye. I want to get into it and no better time then during these very cold days. The FitBit activity tracker caught my eye!!! This certainly looks really interesting and amazing !